A community organization, Lockland Rising, was struggling to save the historic Stearns and Foster General Office Building. This building once served as the epicenter of the large and thriving Midwestern manufacturing city of Lockland, Ohio. Once the economic engine of the Mill Creek Valley, the village of Lockland is barely recognizable today as the regional hub of manufacturing and retail activity that it was decades ago. A small group of volunteers dedicated to historic preservation recognized the deep historic importance of the building but were unsure where to start in rescuing it. They knew a coworking space and business incubator would be a way to bring businesses back to the region. The team created a business plan for a coworking space called Tenaciti Coworking. 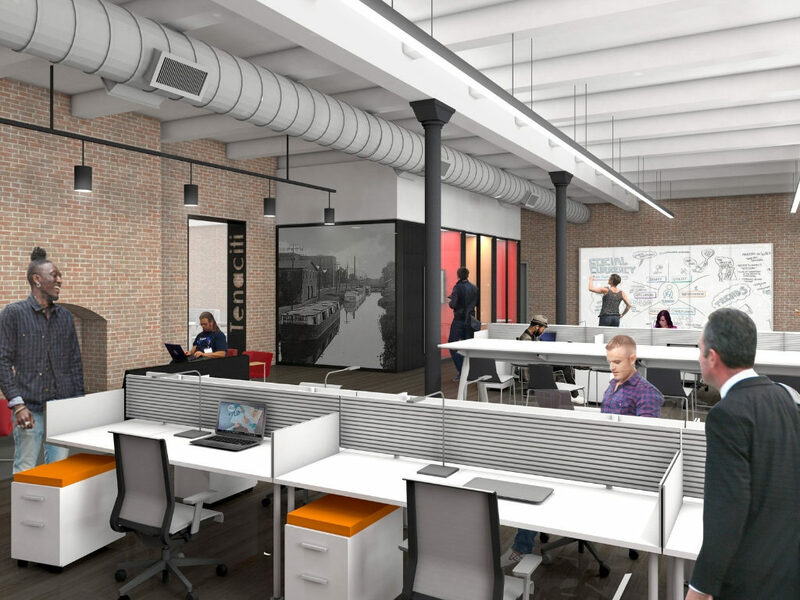 A359 Partners in Architecture stepped in to do a building renovation assessment and detailed estimates on the viability of the structure for adaptive reuse as a coworking business hub. The work started with hands-on collaboration with the volunteer group and building owner to understand the team’s vision. 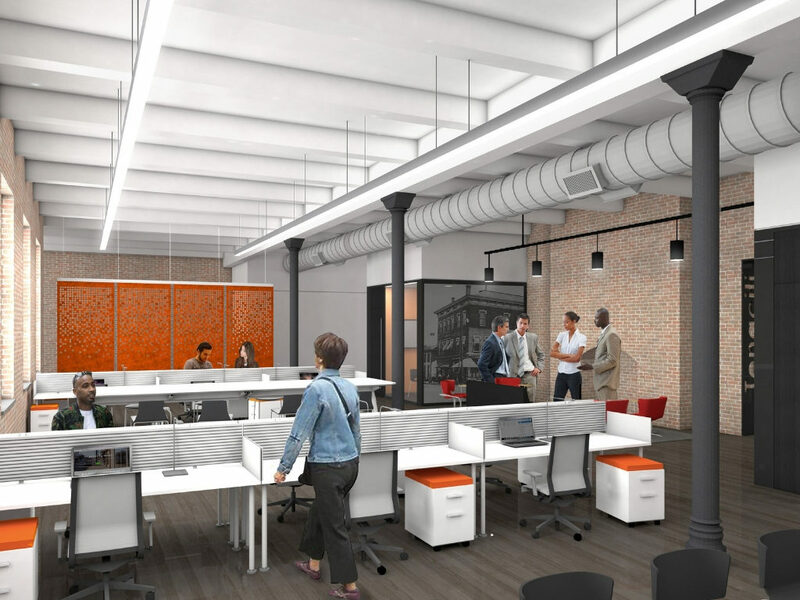 A359 was able to leverage the adaptive reuse, adaptive renovation and coworking interior design work created for the 1819 Innovation Hub to provide a vision for Lockland Rising and Tenaciti Coworking. A359 delivered conceptual renderings showing the architectural vision for the space. The renderings were utilized to communicate the group’s vision and build community support. The team was able to show its vision and gain traction for a fundraising campaign. Money raised is currently helping to replace the roof of this historic building. A359 has also been instrumental in the overall planning of the stabilization and renovation of the Stearns & Foster Office Building and the interior fit-out of Tenaciti Coworking. Our scope of architectural services includes a building survey and the development of as-built drawings for the Stearns & Foster Building, building stabilization and building envelope renovation. Schematic design, design development and construction documents will follow for the transformation of the facility to open-office work space, tenant suites and meeting spaces. We are proud to help Lockland Rising in its commitment to historic renovation and turning Lockland’s vacant buildings into usable spaces that benefit the entire community. Lockland Rising has been requested by Duke Energy to apply for an urban revitalization grant in March 2019 in collaboration with the Hamilton County Development Center (HCDC). We will assist the team in the grant application as the historic renovation architects of record. This project involves the revitalization of a baker’s residence and public oven next to the historic Grand Mosque in the medina of Salé. The residence will be converted to a café and guest house with views to the ocean. The public oven will be renovated and continue to serve the local residents. Blending historic character with modern minimalist aesthetic fulfills the goals of both owner and community. This project is being design in collaboration with Clock Café, a restaurant chain fostering cross-cultural experiences with locations in Fes, Marrakech, and Chefchaouen. This rural villa is located in the bucolic Ourika river valley which serves as an escape from the noise of bustling Marrakech. Local building methods and materials create a traditional and rustic sensory experience while still incorporating modern amenities. The arrangement of living room and terraces on the upper floors treats the inhabitants to uninterrupted views of the nearby Atlas Mountains. This co-working office will house a developer, architect, engineer, and material supplier under one roof. 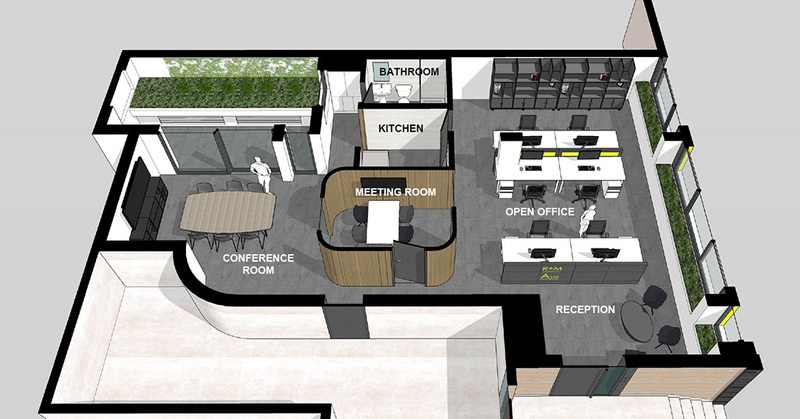 A mixture of open office with breakout private areas encourages collaboration while providing privacy when needed. The raw unfinished aesthetic allows the various tenants to “plug in” their brands. This project is being done in collaboration with developer R&M Immobilier. Afriquia is the largest fueling station chain in Morocco. For this location in Ain El Aouda, the single story Afriquia prototype was modified into larger mixed use building containing a repair shop, café, restaurant, grocery store, and event hall. Currently under construction, this project was done in collaboration with architect Mounir Essalhi. Located on Grand Island, New York, Herb’N Garden Farms is a hydroponic greenhouse growing herbicide- and pesticide-free vegetables for Western New York. The herbal entrepreneurs of Herb’N Gardens asked A359 Partners in Architecture for assistance in master planning and conceptualizing a new facility on four acres not far from Buffalo. The site design required collaboration with a greenhouse vendor and the local civil engineer to maximize the grow areas, handle stormwater and accommodate utilities. A359’s focus was fulfilling the client’s vision of a modern, funky farmhouse space that impresses clients while serving the farm’s needs. It was also important for the architecture to express the client’s sense of humor and quirky personality. The development starts with a modest first phase of three greenhouses and a small utility/storage structure. It will ultimately expand through as many as six phases to maximize build-out on the property. The Head House design includes office and meeting space, storage and packing areas, as well as social space for events and celebrations. Generous deck space faces the front and provides for indoor/outdoor activity in favorable weather. The structure is designed for economy and flexibility using readily available materials. A single-sloped shed roof simplifies roof framing and maximizes northern exposure while minimizing shade on the greenhouses. A359’s conceptual renderings show the phased development approach while conveying the playful architectural vision. 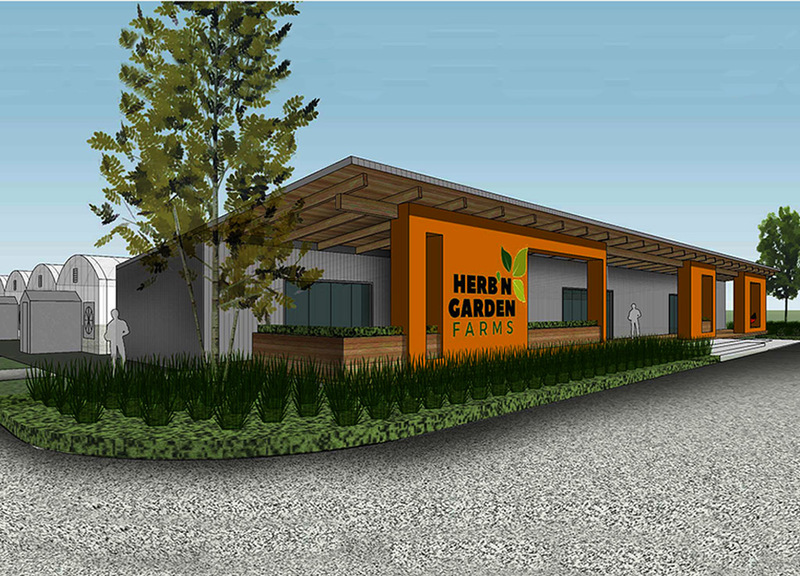 The renderings were extremely helpful in communicating Herb’N Garden’s vision to the local planning board.